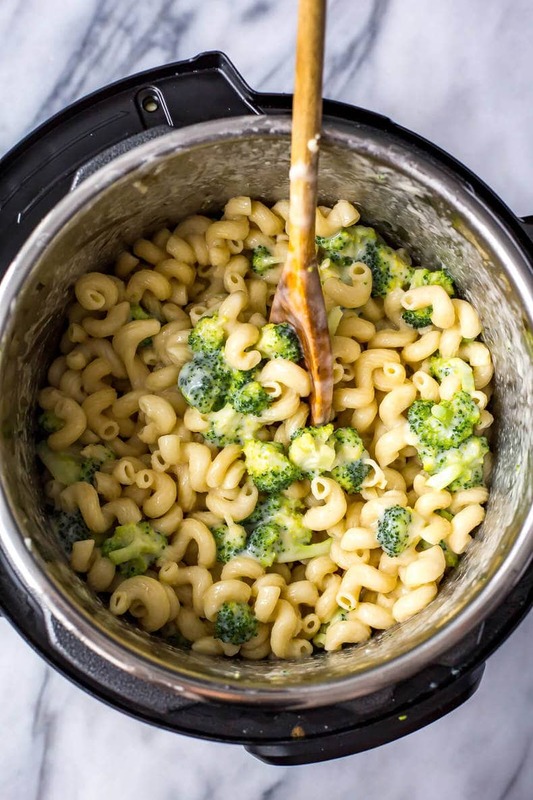 This Healthy Instant Pot Mac and Cheese with broccoli and white cheddar is a creamy, delicious comfort food favourite that comes together with less than 10 ingredients and in one pot! Have I ever got a killer recipe idea for you today. And it's superrrrrrrr easy. 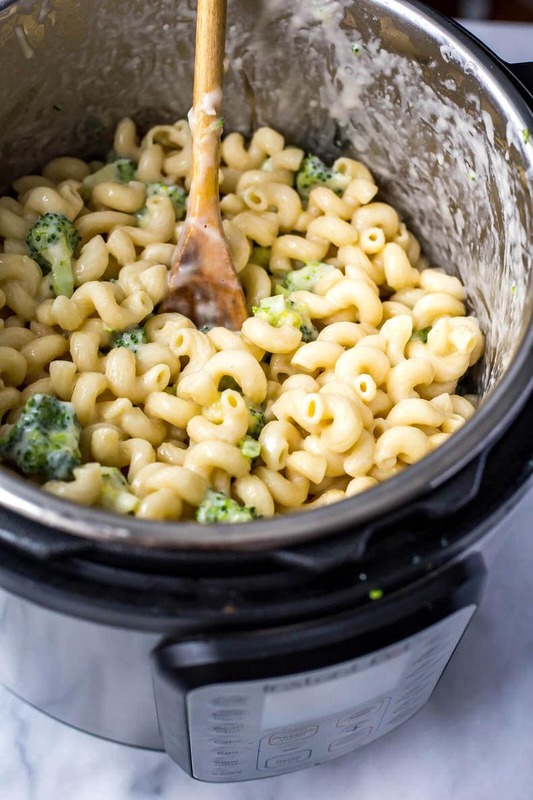 I'm talking Healthy Instant Pot Mac and Cheese. With white cheddar and broccoli. OMG I'm dying this stuff is so good. And it's not bad for you either! And I think it's pretty evident that I'm a HUGE mac and cheese fan. I'm talking Truffle Mac and Cheese, Butternut Squash Mac and Cheese and even a BUILD YOUR OWN Mac and Cheese Bar! I'm obsessed. It's also an almost 5-ingredient recipe too, and no fail. 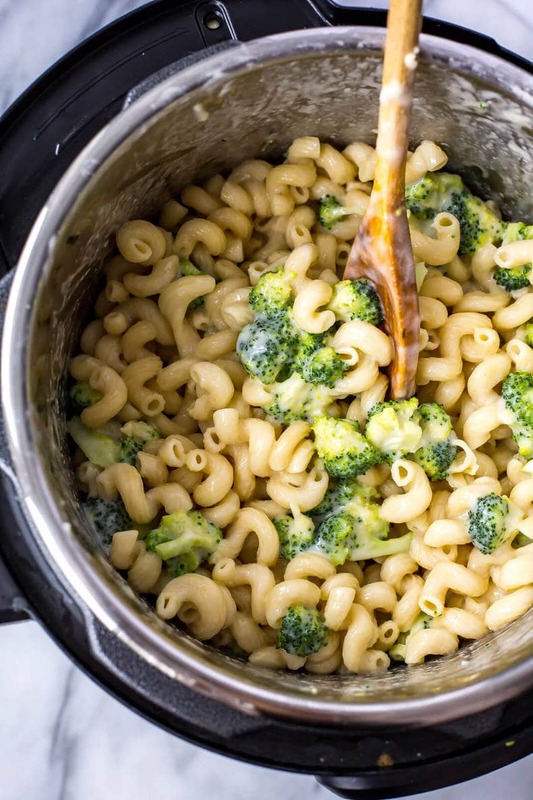 Dump some butter, water, salt and macaroni spirals into your Instant Pot. Cook on high pressure for 2 minutes. Remove the lid, dump in your milk and cheese and stir. Add you broccoli and stir. Close the lid and wait another 2 minutes. Then boom, dinner is ready. I can't get over how easy and delicious this is. 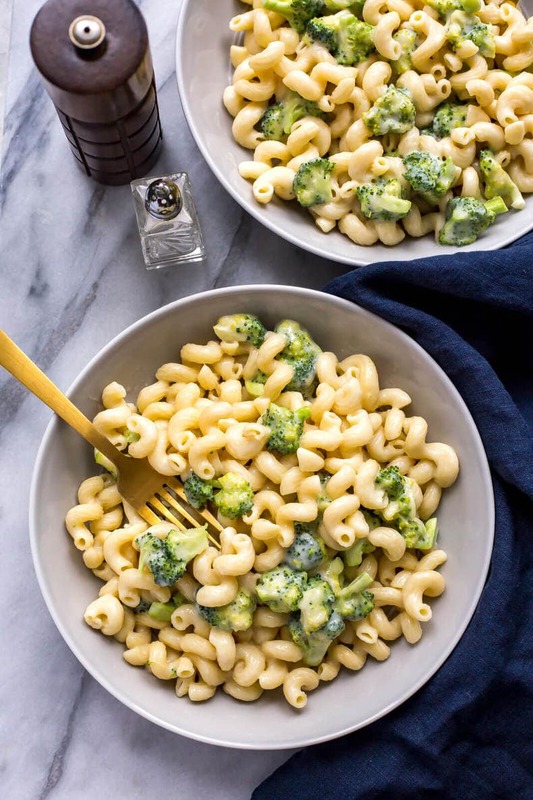 Now, I should warn you that this Healthy Instant Pot Mac and Cheese is more like a Kraft Dinner style mac and cheese as opposed to one you make with a roux using flour. It's still pretty creamy and cheesy but it's definitely more liquidly than mac and cheeses that have a thicker sauce. The sauce is thinner, but it makes this dish feel lighter and it also takes way less time and is more hands off. I don't know about you but honestly sometimes I just want to dump everything into one pot, set it and forget it. This is the mac and cheese for that! 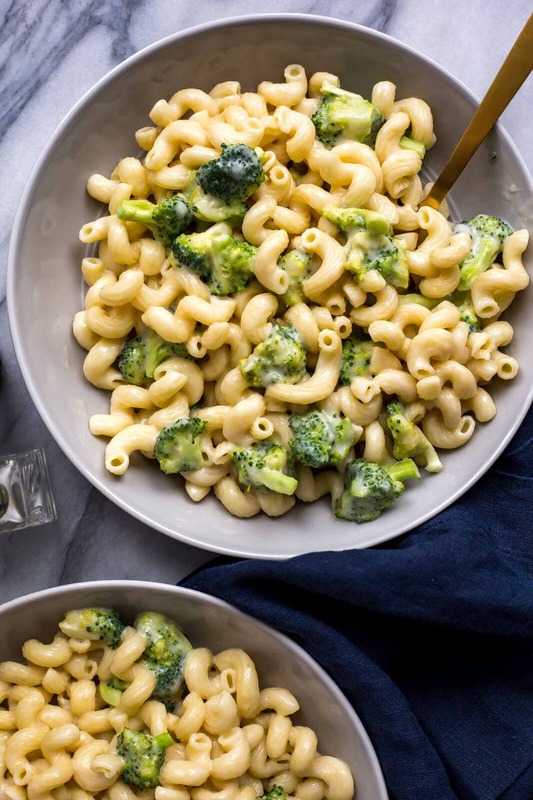 The broccoli adds a little bit of colour and adds the health factor to this mac and cheese so you can rest easy knowing that you've made yourself at least a bit more of a well-rounded meal. Add in some extra greens like spinach or chard and you are practically eating a green goddess version of mac and cheese. LOL I know, the irony of those two titles together. 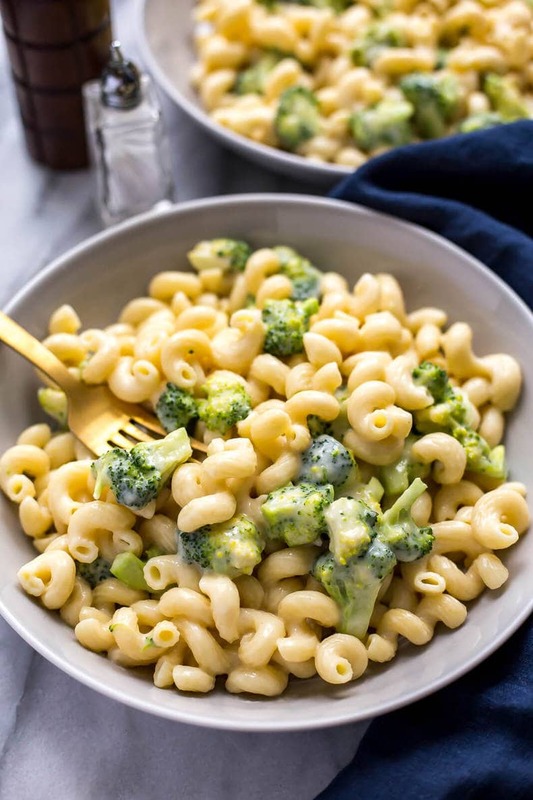 If there's anything else you should know about this Healthy Instant Pot Mac and Cheese is that I also find that using the macaroni spirals (sometimes called Scooby Do at the grocery store) hold up a bit better because they're a bigger pasta shape. I wouldn't recommend you use the smaller macaroni pasta or even the shells but it's up to you. Plus, spirals are just more fun anyway. Let's also talk about white cheddar for a second and how amazing it is. 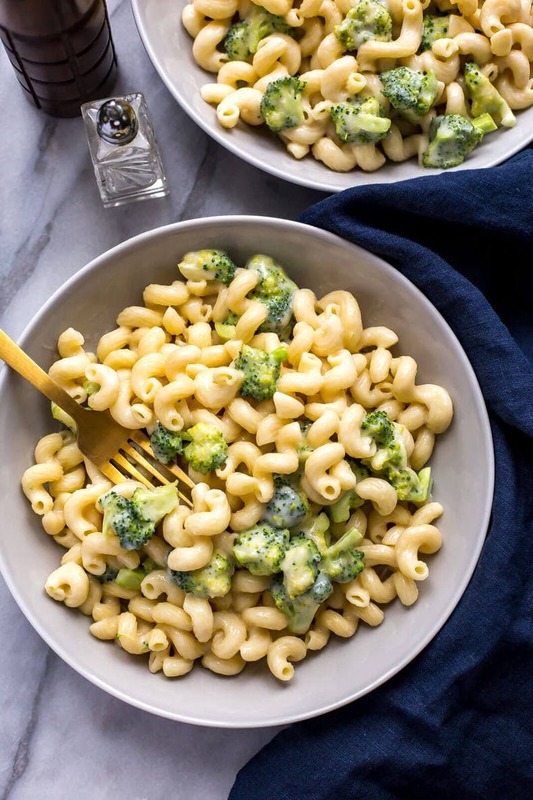 I really feel like you need to splurge and go all out on the cheese with this Healthy Instant Pot Mac and Cheese – I bought a $12 block of Balderston aged white cheddar (the one with the turquoise-green label and NO they didn't pay me to write about how much I love them lol!) and it was almost just enough cheese for the job. I do recommend 4 cups of cheese for that extra gooey-ness but you can certainly use less (3 cups will do) so one block is usually enough. If you really wanna get fancy you can also use some grated parmesan or pizza mozzarella, or Swiss cheese would be nice too. 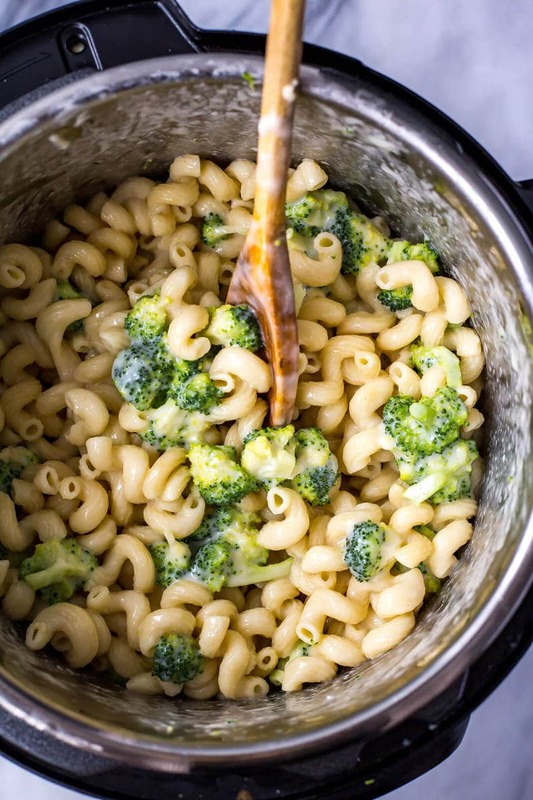 Will you be making this Healthy Instant Pot Mac and Cheese? Anything white cheddar has my heart for as long as it's still acceptable to consume tons of comfort food! BRB while I go back to eating piles of this. 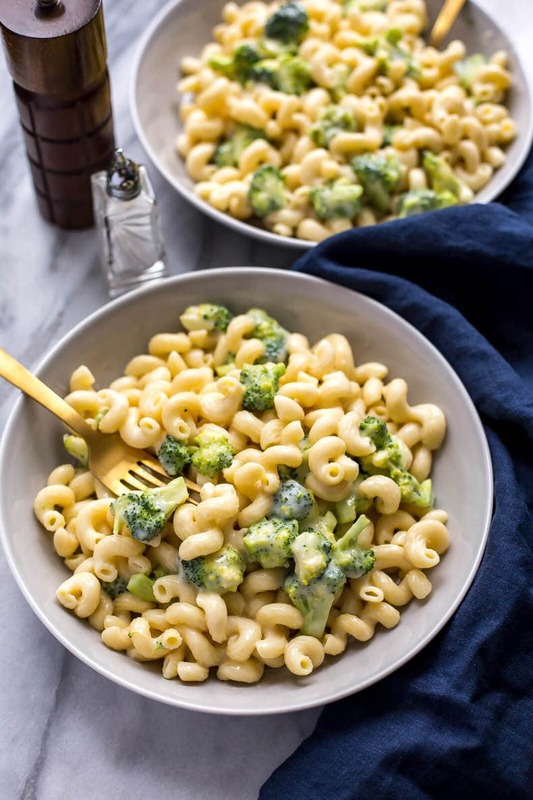 This Healthy Instant Pot Mac and Cheese with white cheddar and broccoli is a creamy, delicious comfort food favourite that comes together with less than 10 ingredients and in one pot! Add butter, water, salt and macaroni spirals to Instant Pot in that order. Set to cook on high pressure for 2 minutes. Once complete, do a quick release of pressure and open lid when safe to do so. Stir in milk and white cheddar until fully blended, then add broccoli florets and stir. Replace the lid and let sit 5 minutes. Serve and enjoy! Saw this on FB today, tried it tonight and loved it … 2 cups was to much water so I had to drain it but still amazing. I think next time I’ll used several types of cheese. Oh no! I’m sorry it was too much water – may be an excuse for me to do a third recipe testing session 😉 Thanks so much for your feedback Monique and happy you enjoyed it! Can you do this just in a large saucepan? With the same method? Hey, this looks really good. Do you think I can freeze the leftovers? You could definitely try! Most pasta dishes usually freeze well 🙂 I just haven’t tried it myself! The first comment notes that 2 cups of water is to much, you agreed. But the recipe calls for 4 cups of water what do you use. The recipe looks amazing would like to try it. Sorry Shirley, I didn’t notice that Monique said “2 cups” instead of 4 cups. I didn’t necessarily agree with her, I just apologized that it turned out that way when she made it. There are many reasons why this amount may have been too much water for her – maybe she used a different shape of pasta, or maybe she didn’t use one full pound of the pasta shape I used (I find people guesstimate quite a bit when adding pasta instead of following the recipe exactly, I often am guilty of this myself). Four cups of water is the right amount if you are using macaroni spirals as pictured and listed in the instructions. Hope this helps! Yes that does help. Thanks so much for replying so quickly. I will look for the pasta that you used. I’m sorry that I said you agreed I do see that you were apologizing. Could I double this and use the same amount of time? To be honest I’m really not sure Heather, I haven’t tried it myself! 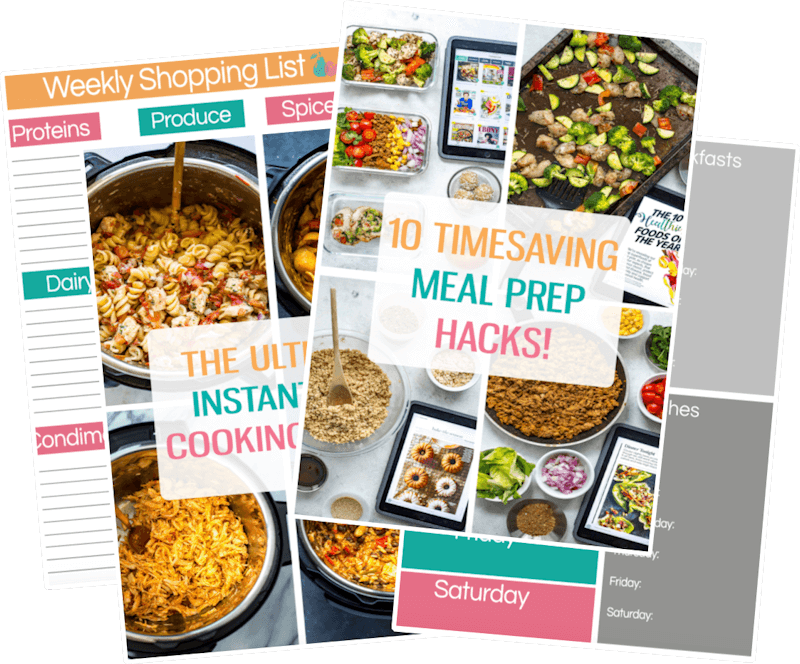 I’ve heard of people just doubling a recipe and adding a minute to the cook time for different Instant Pot recipes, but I just can’t guarantee the results if that makes sense. Let me know if you try it! You will need to divide the pasta into 8 servings – I’m sorry I can’t give a more specific measurement but if I had to guess, I would say 1 1/2 cups. Hope that helps! I’m new to your blog and have noticed that in the nutritional info section on your recipes it doesn’t say how much one serving is. What do you consider to be a serving? 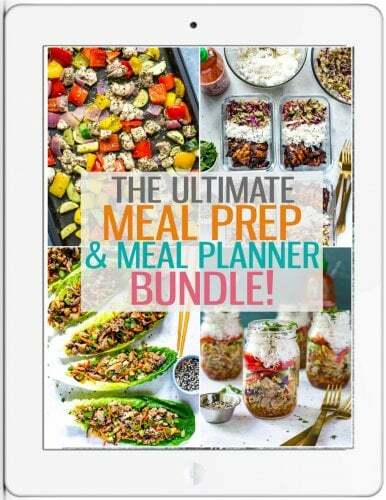 Hey Morgan…I provide number of servings at the top of each recipe! If something says 6 servings, divide it in 6 and that would be considered one serving. Unfortunately I’m not able to go measuring everything into exact portion sizes – it’s challenging enough just to calculate the nutrition facts. Sorry about this! Can I use whole wheat pasta? Will the recipe be the same? Made this tonight–quick and easy (and tasted great!). Only problem is that even after letting the broccoli sit in the pot for 10+ minutes, it was still raw 😕 Cover was closed and everything. Next time, I’ll add at the beginning, and cook with the pasta. So happy you liked it Jen! Sometimes it depends on how small you have chopped the broccoli..you could also try adding it in after and pressing the “keep warm” button to add a bit more heat. I wouldn’t add the broccoli in at the beginning to pressure cook because it will get really mushy! Hey Vicky!! Thanks so much 🙂 Yes the nutrition facts are for one serving, hope that helps! Sorry I am just seeing this now. Thanks for the reply. I thought I did something wrong but good to hear this about using real cheese. It was so good I hate to not make it again. 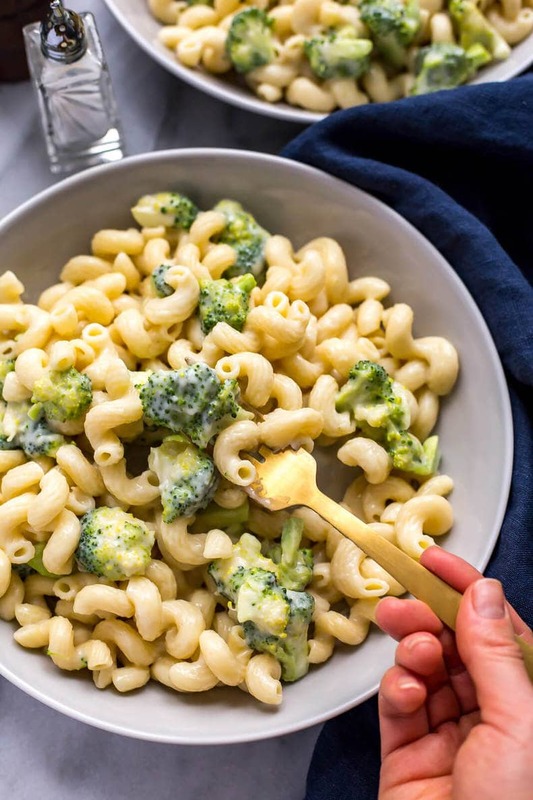 Hi there, the recipe show total cook time as 20 min but it says to only cook maccaroni for 2 min and then add rest of ingredients and let stand for 5min. Is this correct? Hey Aileen – this is an Instant Pot recipe. The Instant Pot takes about 15 min to preheat and pressure cooks for 2 min so the total cook time once factoring in the preheating is closer to 20 min. Hope that helps!